It was the "No FRO onQ" override that I remember possibly being the default in days of old as it did take until the next g-code item or so for the FRO to take effect. Are we talking at cross purposes, or am I missing something? Doesn't the FRO just adjust the feed rates as set in the g-code file? I didn't think it had any affect on the defined acceleration or maximum motor speed so can't see why it would cause an axis fault. All I'm looking for is the ability to compensate for the fact that say I've made a stupid error in the g-code file from Lazycam which was maybe last used to cut a piece of carbon steel at maybe 5mm/min and am actually cutting MDF (or doing an 'aircut') on this job so just want it to cut 10 times faster. Art did make this manual adjustment of percentage override available before. I was hoping it could be done again on a 'manual XML edit' basis as I can't see any downside. Consensus from the 'big boys' was just that, but Art implemented an override in the config file for those of us with small hobby machines who wanted it to have our own specified max override. PLEASE can we have an XML entry to override it by editing the XML manally as before? I don't want to re-raise what is obviously a touchy subject, but is there a solution to the 'large fonts' problem? I know it can be done from the 'appearance' tab rather than 'advanced/large fonts' but this is horribly clunky and really not the way to do it for best overall results in Windows. Most modern screens are both big and have a lot of pixels (my Dell 2407's are 1920 x 1200) and REALLY need large fonts set to be readable. Windows provides a mechanism to handle this if all screens are coded using "dialog units" whereby it calculates the display font and display element size based on dialog units and a multiplier/divider calculated from the dpi setting (I've written several screen designers that do it this way and it works well (though not quite perfectly in all cases)). Just wondering if there was a solution to this other than using 'appearances' which isn't acceptable. Has anyone designed a screenset using 'large fonts'? You may well have a point about the 3.3v issue, especially as I ordered an PCMCIA parallel port card and it was only on the despatch email that the the vendor said it may not be suitable for Dell Inspiron notebooks as they 'didn't supply 5v to the PCMCIA card slot'. However, the card runs a Laserjet 5000 perfectly, and appears to run the Bob Campbell interface board OK, though I can easily solve the 3.3v to 5v level shift if that proves to be an issue. I suspect though that it's a Mach3 pulse driver/Vista interaction because I'm getting VERY variable rates in the diagnostic test program and in the diagnostics screen of Mach3. The motor movement suggests that the pulse driver is getting its timeslice interrupted as I get short bursts of smooth and then jumpy movement. I've only got the Dell 9300 on Vista so far (Only willing to go so far along the 'bleeding edge' as all other machines are work critical). The old AJP 300MHz PIII notebook that used to drive Mach2 perfectly seems no longer adequate for Mach3 (and that did drive its built-in parallel port perfectly), so I wanted to try the Dell as I don't use the CNC often (1st time in three years after a house move and renovation), though want to get back to using it more. Would like to help get Vista running (and have full DevStudio installed and can do any level of debugging if Art will trust me with driver code and test program). In the meantime, I've got nearly all the bits for another PC, so am putting together a 3GHz P4 to run XP. Anyone else managed to get Mach3 (latest build) running on Vista? I can get drivertest and Mach3 to run, but the pulse timing is VERY erratic and makes it unusable. I'm running on a 2.13GHz Dell Inspiron 9300 Notebook with 6800Go graphics. LazyCam (Beta) / Re: Possible bug in Lazycam? 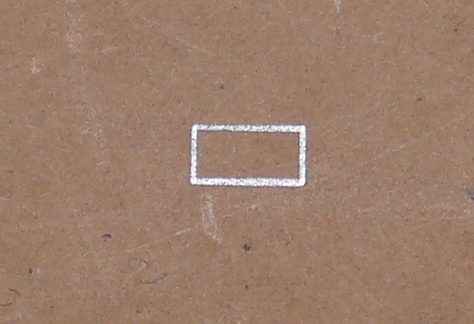 Picture was slightly out of square and I haven't photo adjusted, but actual result looks a good rectangle to me. I'll try and rig up a pen and try that after work. For what it's worth, all the holes measure correctly from the lower edge to within .02mm (which is amazingly accurate). RH portion of the top cut is now straight. Wouldn't the top righthand cut slope upwards if backlash was the problem (it did slope down before the Mach3 fix whilst the left portion of the top cut was straight and parallel to the bottom cut).